If you’re a coffee fan like me, I’m sure your Instagram feed is filled with adorable coffee sleeves worth of featuring in your pics. I myself have a few Disney-related knit coffee sleeves that I’ve purchased from Etsy, and have previously made 101 Dalmations DIY coffee sleeves for my blog. Even though I primarily drink iced coffee, I love to have a sleeve so that my head doesn’t get cold (especially in the early mornings) while I’m toting my beverage. While I was thinking more about new cute DIY’s for coffee sleeves,, it got me to thinking that it would be adorable if there was a coffee sleeve made specifically for dome cup lids (like what you get when you order a frapp). 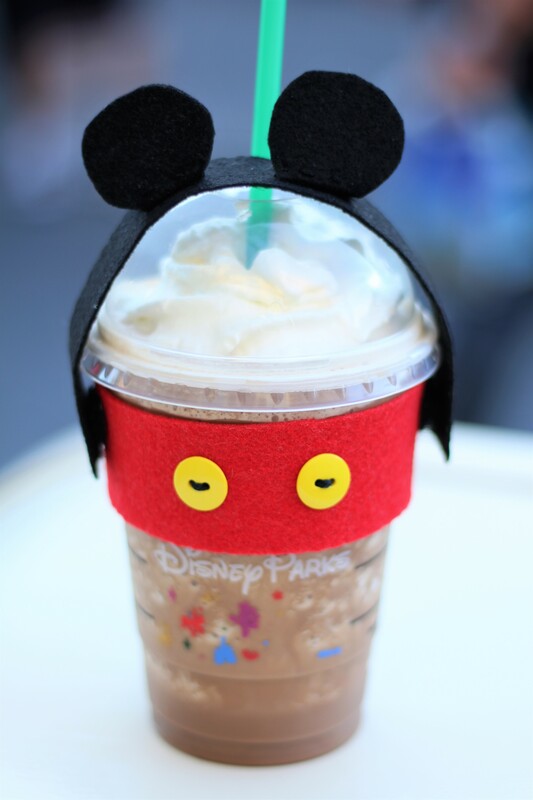 I decided to make a Mickey Mouse coffee sleeve for a dome cup lid that would give your lid its own set of Mickey ears! It just seemed too Disney Instagram-worthy to rock a pair of mouse ears while your Disney Parks Starbucks cup does, too! NOTE: You can hot glue instead of sew, but sewing I found makes the sleeve turn out with a cleaner look. Cut out your template pieces and trace the shapes over your felts. Sew on your two yellow buttons in the front to look like Mickey’s pants. Sew on your small piece of elastic and your button in the back of your red felt piece, to help close up your coffee sleeve. 5. On the sides of your red felt piece, place two small pieces of Velcro (this will be to attach the dome lid Mickey ear “headband”. 6. Now moving on to the black pieces of your felt. Fold your Mickey ears along the line between the top and bottom of your keyhold shape, and sew the flat part of your felt ears onto the middle of your black strip. 7. On the inside part of your black headband strip, place two pieces of Velcro so that you can attach your black piece to your red piece.